At Word Coptic Workshop 2, participants will complete the sewing of their books with advice and assistance (when necessary) from instructors. Participants will sew the second covers on and complete their word Coptic journals to take away that evening. Join Book Arts Collaborative at the Kennedy Library for an exciting Valentine’s Event. We will be running a bed press where children can come make their very own Valentines! Come meet the students and faculty of Book Arts Collaborative and learn how to run a press. 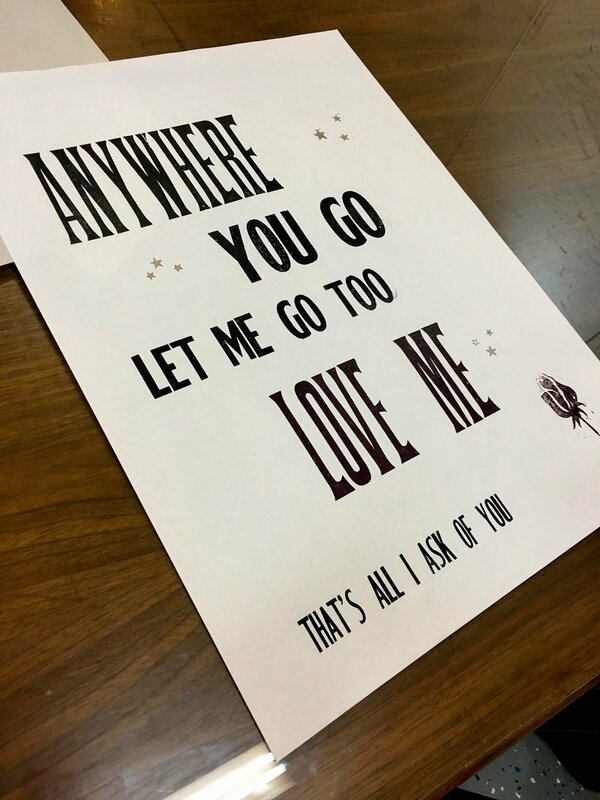 If you and your family would like to make more Valentines, stop by Tribune Showprint and Book Arts Collaborative for First Thursday, running from 5:00 pm - 8:00 pm! Join us at Tribune Showprint Posters and the Book Arts Collaborative for a presentation, pop-up shop, exhibition, and book signing from Chris Fritton, AKA The Itinerant Printer! Chris Fritton (The Itinerant Printer) has been traveling North America for over four years visiting different letterpress print shops, creating unique prints at each of his stops. He brings with him only paper and ink, and works exclusively with what those shops have to offer. He recently completed a formidable coffee table book cataloging the adventure, and it features Tribune Showprint and other regional print shops as well. Part travel diary, part cultural anthropology, part philosophical musing, part poetic digression, The Itinerant Printer book is a series of interconnected yet independent vignettes that tell the story of two and a half years on the road visiting letterpress shops throughout America & Canada. It's the ultimate index of this printing adventure, the culmination of all the miles, all the ink, all the paper, all the type, and the blood, sweat, and tears. Chris will be sharing stories from the road at around 7:00p, and the presentation runs concurrent with a pop-up exhibition/shop. He'll be showing and selling work from his adventure, signing his book and taking questions about all things letterpress, road trips, and tramp printing! Don't miss this Muncie print party, with drinks and refreshments on hand as well! Come say hi and grab a print to take home! Tribune Showprint Posters and the Book Arts Collaborative are located at 515 E. Main St. Muncie, IN. This event is free and open to the public, and you can RSVP below. 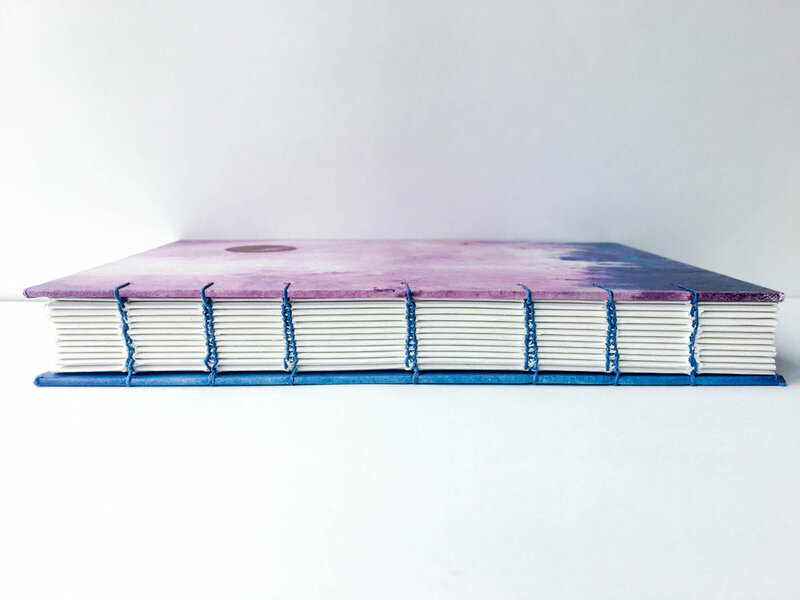 Belgian or "Secret Belgian" binding is a contemporary style book that combines the look of Japanese stab binding with the functionality of a Coptic sketchbook. It looks complicated but is easy to learn. No experience is necessary to join in this workshop, and you will make a completed blank book in one day. This workshop runs from 11 a.m. until 5 p.m. with a one hour lunch break at a natural stopping point. Participants will be guided through covering boards with decorative paper, choosing a pattern for piercing and sewing the covers together, fold gatherings, and stitch them into place. The resulting journal is a stylish and functional notebook that makes a statement blending contemporary and ancient styles. 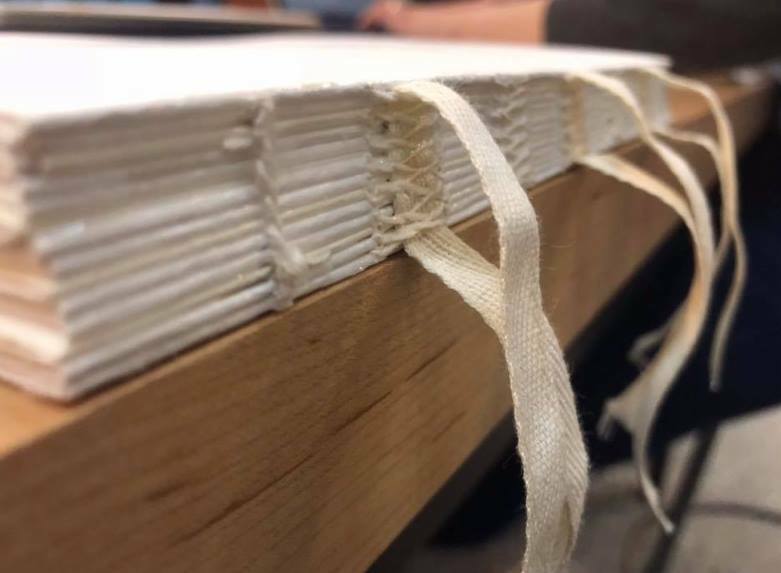 This course is the companion to Introduction to Book Binding 1, but if you didn’t take that session, you can still come. We’ll provide you with a sewn-up text block for $10, and you can catch right up with the rest. 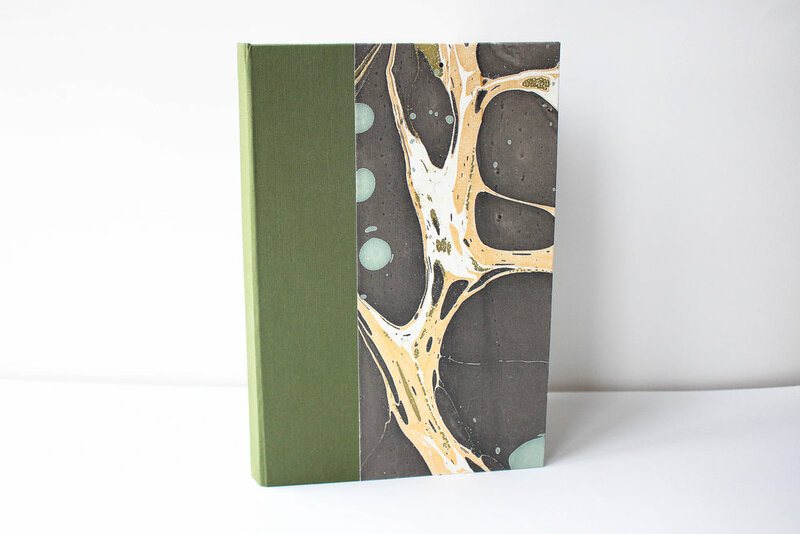 Participants will create “hard” book covers for a 6 x 9” text block, and walk away with a finished case book at the end of the evening. There is absolutely no experience necessary; you don’t even have to know how to read because these are blank books, suitable for travel journals, diaries, etc. Come, learn more about the emergence of the codex. You’ll finish a book in a centuries old style that still looks surprisingly modern. Learn to sew a text block in the French link style. Sewing paper into a book form is much easier than spinning straw into gold. In fact, no experience is necessary for this workshop which covers one of the most durable of the casebook stitching styles. No experience is necessary. Introduction to Printing 2 focuses on setting chases for platen presses. You don’t need to know what “letterpress” means to join this class; we’ll give you hands-on experience. Participants in this workshop will set a chase for small greeting cards or coasters bearing a word or an image. They will block it in to prepare it for printing, ink a press, and assist their fellow workshop participants in cleaning presses at the end of the evening. Book Arts Collaborative is closed for a private event. If you or your organization would like to schedule a private event at Book Arts Collaborative, email Dr. Rai Peterson (Rai@bsu.edu) to learn more. The annual First Thursday ArtsWalk is here! For more information on the ArtsWalk event, check out the Downtown Muncie website. June 30 (Saturday) 1:00-4:00 p.m.
Come for a fun afternoon of printing and binding. Kids can print images or words on the cover of a small summer sketchbook, then sew it together using a simple through-the-cover stitch. No experience necessary. This is for beginners. Kids from 6-10 are encouraged to attend. All materials and tools are supplied. 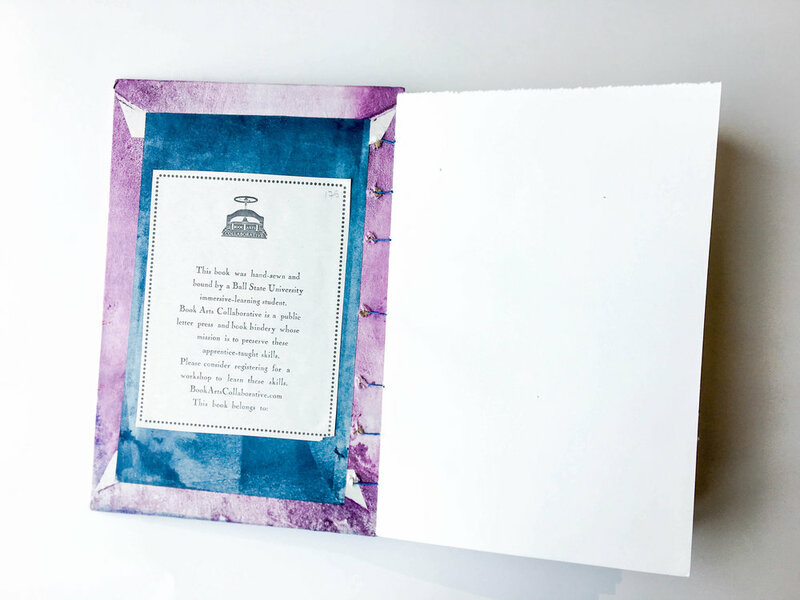 Parents are encouraged to stay with their children and learn about printing and binding. Casebook is the "bookiest of books." Learn to sew a text block in French link stitching and the build a cover and case it in. Make a complete book in one day! No experience necessary. This is for beginners and returning book binders.